We do buy quality stringed instruments, and accept them on trade. We encourage sellers to research up front and get an idea of the used value of their instrument, and to understand our purchase or trade-in offer will be a used WHOLESALE price (about 1/3 or 1/2 less than the used retail price). See below for info on valuing your instrument for sale. Trade-in of an instrument purchased at QBC: your trade-in value starts at 80% of what you paid (less sales tax), depending on condition. QBC may offer up to 100% of the original purchase price if the price of the new purchase is 20% or more than what you paid for the instrument you are trading in, and will offer less than 80% trade-in value if there is wear and tear on the instrument and/or case. - Bring us your instrument, along with any appraisal, purchase receipt, or written valuation you may have (if any). Include any accessory items you intend to convey with the sale. - Please provide an ID, and we will provide you with a bill of sale showing we purchased the instrument from you, with your affirmation the instrument was your property and you have the right to sell it. 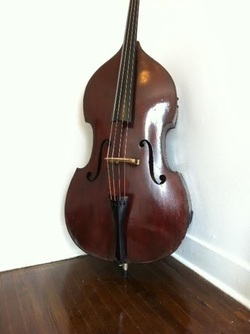 ​Consignments: why choose Quantum Bass Center to consign your stringed instrument? Professional knowledge: our sales staff are professional bassists in contact with the world's most discerning recitalists, orchestra and jazz professionals, and educators. Each of us has been a professional bassist for between 25 and 40 years. We have a broad first-hand knowledge base of fine double basses and the needs of their players. We stay in close contact with what our buying customers are looking for, and what our selling customers are interested in consigning, and have a very high success rate in matching instruments with buyers quickly. - Assertive advertising: we advertise each instrument in inventory individually, have multiple advertising platforms, and are a sought-after exhibitor at several annual and semi-annual conventions. - Fairness to consigner and buyer: our consignment rate is below average, and we are flexible. - Quality repairs, setup and adjustments: our luthiery training comes from the finest restorers and makers in the business. Our expertise in bass setup is the result of our performing experience as well as the continuous feedback from makers and our customers, which include orchestra members and jazz artists from across the globe. We can put your instrument in condition for sale, and work with the buyer on his or her desired setup. - Inventory: Quantum Bass Center is known as the place in our region for the best selection of double basses in all price ranges. Our very large collection attracts significant traffic in potential buyers. Buyers know our reputation for good setup, and continually seek us out. - We support makers: we proudly support the artisanal work of world's best makers of new basses and bows by offering them the most generous net. By supporting makers fairly, we are able to present to the public a bigger selection of fine new instruments as well as get makers exposure in a respected shop. Representation is by invitation only, so we present only the best, and makers are pleased to have us display their best work - you won't find budget models that were created for the dealer's profit margin. - No up-front costs: you are not asked to pay in advance for repairs to an instrument you are consigning for sale. - No restrictions on either leaving your instrument or redeeming it. We believe that selling your instrument though Quantum Bass Center will get you the most return, over a private sale or other stores. If it's not selling, we are happy to discuss ways to increase its appeal. We don't expect instruments to sell themselves. - We work for our commission: we advertise your instrument individually in multiple sales channels, keep photos and ads current, maintain your instrument and warranty it after the sale at our expense. - No charge for our appraisals on instruments purchased at Quantum Bass Center, if it's within our scope to appraise it. If we are not able to accurately appraise it, we will tell you. - Bigger payout to you AND a better value for buyers: since we inspect, adjust, ship, appraise, and warranty your consigned instrument, and have financing options available - all valuable services to buyers - in most cases, we can net you more for your consigned bass than selling it privately! These are all services a buyer would have to pay for separately, at much greater cost - and in some cases (such as a warranty), cannot obtain from a shop for a privately-sold instrument. - Easier sales: because we can adjust an instrument on the spot to suit a buyer, it is often easier for a shop to please the customer considering a purchase. Doesn't like the case that comes with it? No problem, he can exchange it for his choice. Do the supplied strings not suit his playing? No problem - we can install any of a dozen or more brands of his choice, often at no additional cost. - No waiting period for your disbursement! If we sold it and the check has cleared, your net amount is yours. - Post-sale peace of mind for buyer and seller: our consignment customers can have closure when their instrument sells, knowing they will not have continuing questions about the condition or value of the instrument, or unsuccessful financial arrangements. Our clients buying a bass need have no hesitation asking for post-sale support of any kind - it's our job to provide it. - We take trade-ins: because we can (often) take a trade-in or get a buyer's previous instrument sold so he can afford your bass, we make sales possible that simply could not happen with cash-only terms. We welcome quality consignment stringed instruments that are from reputable makers, and are in good repair and optimum playing condition. Although we may recommend repairs when we inspect a bass for acceptance on consignment, owners are under no obligation to have repairs done at our facility. Repairs from our shop must be paid if the owner reclaims a bass from consignment, or can be deducted from the net paid to the owner when the instrument sells. - Bring us your instrument, along with any appraisals or purchase receipts. Unless it is a rare instrument, you don't need an appointment - all our customer service staff can assist you. - We may recommend repairs or adjustments, which we would do at no out-of-pocket cost to you, unless you pick up the instrument before it is sold. - We will sign a contract specifying the selling price, repairs, and what you will receive when it sells. - Not all instruments increase in value over time. The recent recession has driven down some market sectors in stringed instruments by influencing sellers to drastically lower their prices. Also, the recent influx of quality, new Chinese and instruments has held down resale prices for similar European instruments. - Condition is the primary factor in value. Some damage that results in severe devaluation would be: sound post crack (front or back), bass bar crack, and damage to the neck or neck heel. Other kinds of damage (missing wood, unrepaired cracks, poor prior repairs, warped neck, too-thin fingerboard) also devalues. - Sometimes players originally paid too much. The stringed-instrument business, historically, has been rife with mis-labeled goods, mystery, scant information, scantier documentation, and sometimes, outright fraud. We have made it a mission to thoroughly inform buyers and sellers, research and document, seek second and third opinions, and advocate honest labelling. If we discover an instrument was misrepresented, we'll tell you, and substantiate. It's better that you know, even if it means the instrument is worth less than you were previously told, rather than have it sit unsold. We wouldn't advertise an instrument that's incorrectly identified. - You will probably not receive exactly what you paid - especially if you are selling an instrument you recently bought (within the last 15 years or so). Many consignment customers would like us to advertise an instrument at a higher price than they recently paid, so their net, less commission, will be the same as what they spent. If followed, this practice causes a theoretical 20% increase in the asking price EACH time an instrument is sold, gives the shop a bad reputation for overcharging, making the bass hard to sell, and RAPIDLY AND ARTIFICIALLY PUSHING PRICES UP ALL OVER THE INTERNET, followed by a sales slump and sellers taking large losses. Manufacturers frequently issue new instruments below the cost of similar-quality used ones. We would rather discount our shop commission and ask you to understand that you also will pay a modest commission, than to advertise an instrument over market price. You can think of it as a loss, or as an investment against a market bubble. The 10% you may sacrifice might be, say, under $1000 on the bass you are trying to sell, but $2000, $3000 etc. on the bass you are trying to buy! We accept quality instruments by reputable makers for trade-in. We welcome all types, from entry-level instruments on up, playing or not. Yes, we do accept severely damaged instruments on trade; though their trade-in value may be low due to the large amout of repair labor they will require, we will do all we can to assist you in getting a great replacement instrument for a damaged one. Please allow us to inspect the instrument and make you an offer.